We have a worm bin, a large plywood box our friend Kirm made for us years ago. The idea is to let worms turn vegetable and fruit trimmings into soil in the darkness of the box, safe under the heavy lid that keeps out pests like rats and raccoons. When I open the lid every few days to add more trimmings, all I see are slowly decomposing organic matter and the occasional sow bug. 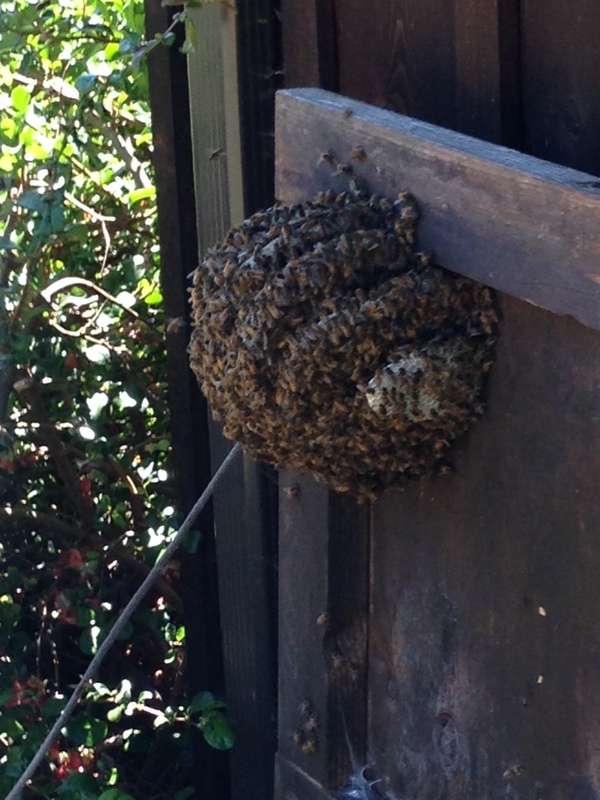 Imagine, then, my surprise when I opened the worm bin on a recent afternoon and saw a mass of honeybees clustered around layers of honeycomb fixed to the upper corner of the lid. What the heck? That buzzing sound I’d heard when I neared the bin suddenly got louder. I quickly closed the lid. 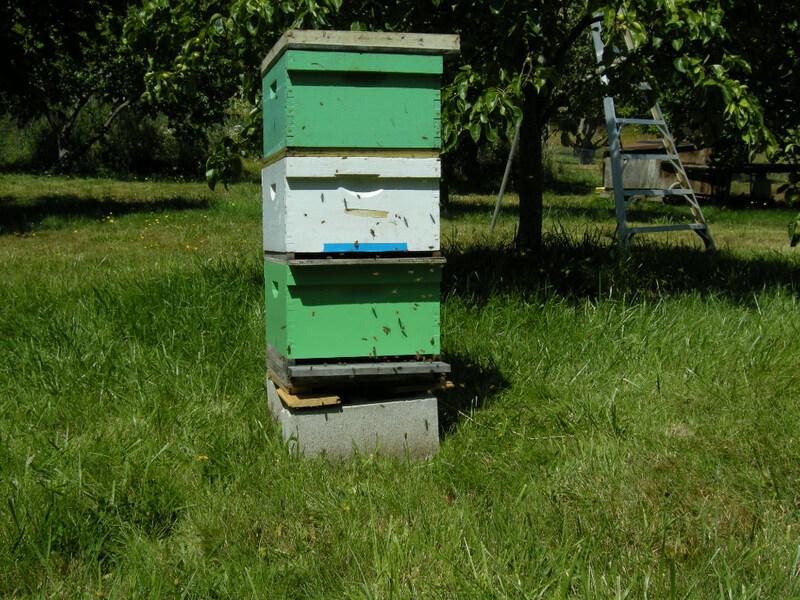 There had been no buzzing or bees five days earlier when I left for a short trip, but in my time away a swarm of bees had found its way through a tiny opening where the lid met the box, perhaps mistaking the worm bin for a hive box. They had been busy. We don’t have beehives but luckily our neighbors Kevin and Mary do. I called them and they agreed to come over that evening with their bee suits and a hive box and take a look. On the phone, Mary explained that swarming often happens this time of year. 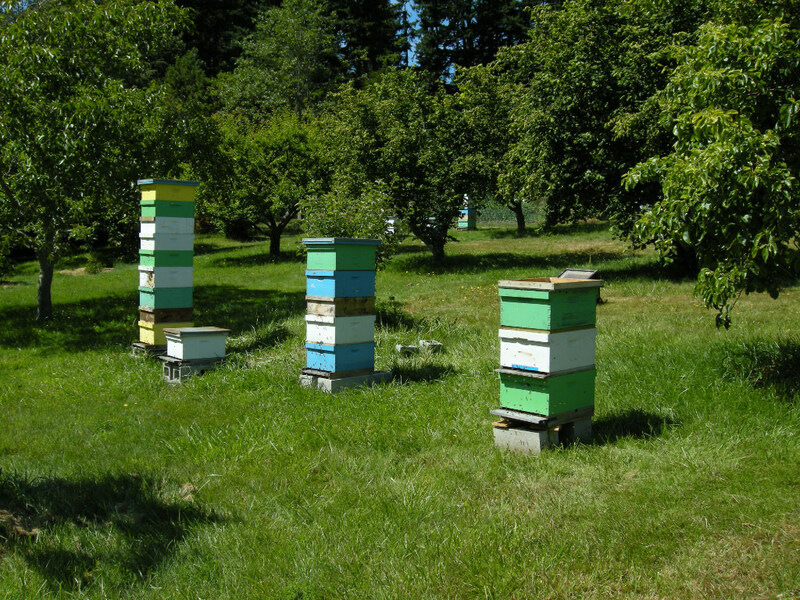 A queen and a large group of worker bees will leave their original hive and go looking, or swarming, for a new home. In this case, they found one in our worm bin. 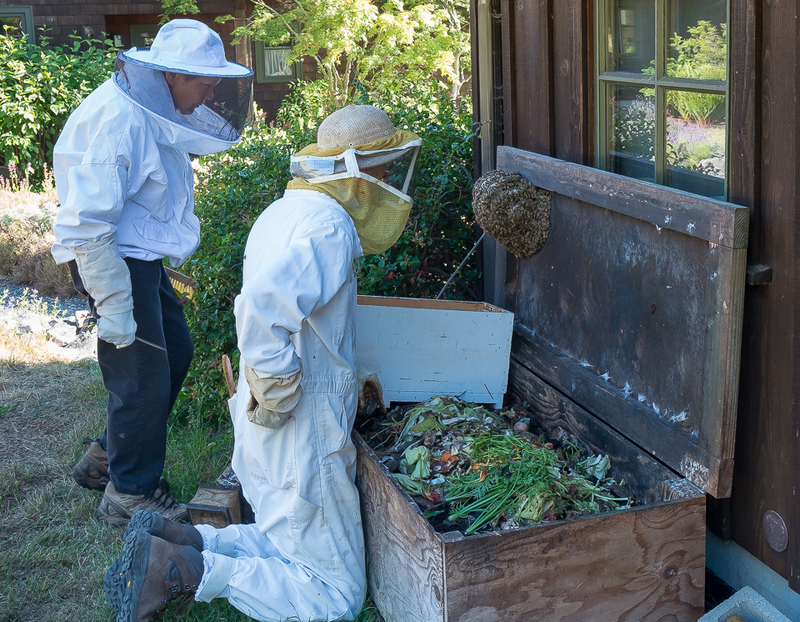 We watched from a distance as Kevin and Mary, dressed in their protective bee gear, studied the layers of comb attached to the worm bin lid and planned how to transfer them to a hive box. 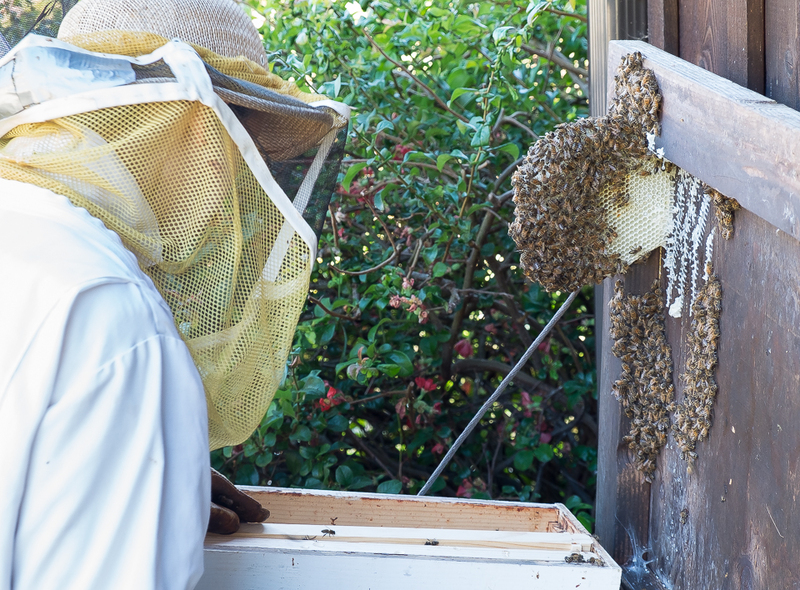 Using a narrow scraper, Kevin gently eased each comb from the plywood lid and lowered it into the hive box. He explained that the comb was very warm and soft so the transfer was a bit tricky. In one of the combs he spotted the queen, a good sign he said for a successful transfer of the swarm to their hive box. A bit of comb broke off and Mary brought us the piece to taste. The honey was warm and runny, delicately sweet and almost fermented tasting like dessert wine. Once they’d transferred the combs to their hive box, Kevin and Mary said they’d leave the hive box sitting in the worm bin until after dark, giving all the bees a chance to return to their new home, and then would come back and take it to join their other hives. I called Mary a few weeks later to see how the new hive was doing. She said they were doing great and a few days later Kevin sent some photos. Here at my house the worm bin is back to its dark, quiet state. There are traces of wax on the lid where the worker bees attached the combs but that’s the only reminder of the temporary tenants. I haven’t tried to close that little gap between the lid and the box, though, hoping that maybe another swarm will decide to visit.